is a diffuse nebula near the better known NGC 6334 Cat's Paw in the zodiacal southern constellation of Scorpius. The nebula contains many proto-stars shielded by dark disks of gas and young stars wrapped in expanding cocoons. 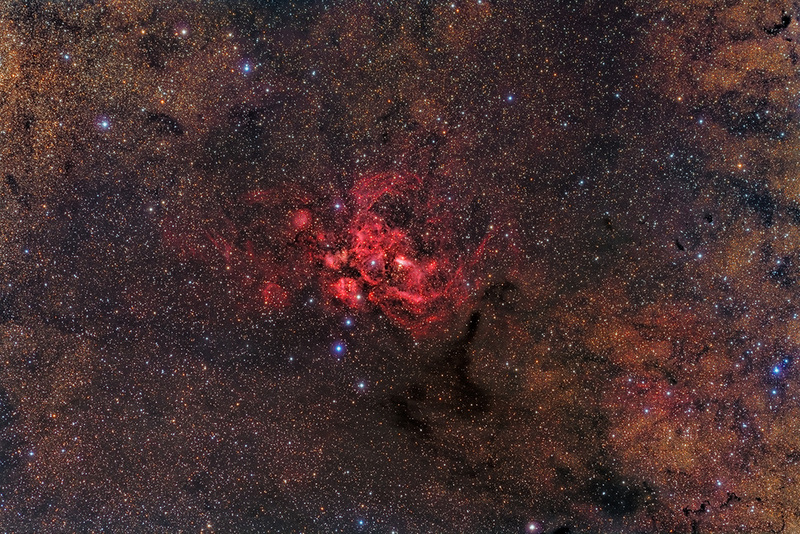 The Lobster is forming some of the most massive stars ever discovered. Its overall red color is a result of the emission of ionized hydrogen gas which glows at 656.3 nanometers. The intricate patterns are caused by complex interactions between interstellar winds, radiation, magnetic fields, and gravity. NGC 6359 spans about 400 light-years and lies about 8,000 light-years away from Earth. Thanks again to Australian imager friend Brett Soames for acquisition.